The very first loudspeaker was introduced to the world in the early 20th century, and today, we have access to millions of its descendants. There are many different speakers in the world to choose from, but all speakers essentially operate on the same basic technological principle as the very first one: translating an electrical signal into an audible sound by using interior metal coils. Even though different speakers operate on the same technological principle, the sound quality that manifests from them has a very high degree of variance depending on the different parameters of the speaker design. The following bookshelf speakers have all been widely reviewed as some of the best choices for consumers on the market interested in a high-quality listening experience. Audioengine HD6 Powered Speakers feature a built-in class A/B monoblock power amplifiers. The inputs of the audio in HD6 include analog, optical and Advanced Bluetooth aptX. The HD6 also features Audiophile-grade components. There are furniture finishes, magnetic grilles, and a convenient remote control made of solid aluminum. The built-in amplifiers of the HD6 have been reported to pack quite a punch, along with being relatively easy to set up. The HD6 features a highly versatile selection of different forms of connectivity, including the following: Stream TIDAL, Spotify, Pandora, YouTube, and any other media player or streaming service that you may have. The connectivity of the HD6 allows it to be wirelessly synced with your smart phone, computer or tablet. If you desire to have the highest degree of resolution, then the HD6 may be connected to the optical input, which is ideal for network music players. The HD6 can be used to easily connect with any component via optical output, which includes your television. If you desire, you may also connect the HD6 to your turntable or subwoofer. The design of the HD6 has been described as a “retro-forward” due to the fact that the manufacturers have prioritized both substance and style. The HD6 features furniture-grade wood veneers and detachable magnetic grilles that give the HD6 an old-school appeal that can seamlessly blend into just about every different kind of environment. The easy setup of the HD6 is made possible with built-in power amplifiers that save you the space that you need while completely doing away with the necessity of connecting the HD6 to any external power amplifiers or stereo receivers. All that you have to do is plug the left speaker into a power outlet and then connect the right passive speaker to the speaker wire from the left. All of the HD6 components are designed together, which allows you to have the Audioengine’s Signature Sound in a much more efficient fashion than what traditional passive speaker than amplifiers would offer you. The quality of the sound is enhanced with diecast aluminum frames of the aluminum woofers, which allows the lower end of sound frequency to truly reach its optimum potential. There are also silk dome tweeters in place which have been technologically upgraded to increase the smoothness and longevity of the highs. The stereo separation and the imaging have also benefited from the implementation of silk dome tweeters. The HD 6 speaker cabinets now boast a design that is much more stable and thick than previous iterations, which allows them to avoid unwanted residence. One customer testified that they greatly enjoy the HD6 due to the fact that they provide great sound without any unnecessary complexity. The customer testified that they came across the HD6 while shopping for different ways to modernize and streamline this secondary music system. What the customer found was that the HD6 was a suitable replacement for a pair of other stereo receivers that they had found particularly pleasing, but just a bit too old. The customer was highly impressed by the way in which Audioengine packaged the HD6. The HD6 came triple boxed, and once unboxed, they found that the HD6 was highly aesthetically pleasing. The customer reported that there were no malfunctions. The sound was pleasingly natural, and the mid-range was very well-rendered to their ear. The dimensions of the product are 20.5 x 17.2 x 14.8”, and it weighs 37.1 pounds. The HD6 can be purchased for the price of $749 the HD6 can be purchased in one of three different color variations: black, cherry, and walnut. The Pioneer Elite SP-EBS73 Dolby Atmos-enabled Andrew Jones Bookshelf Speakers have been designed to give the owner precise control on sound directivity at all frequencies. Because of the true 3-way speaker design, all of the major frequency brands are represented with separate high, midrange, and low frequency drivers. The Dolby-enabled top-firing concentric driver enhances the quality of the sound even higher. The Andrew Jones is ideal for either a main front-channel speaker, or real-channel speakers. The binding post of Andrew Jones is a quad gold-plated 5-way design, and it also features multi-element complex crossover technology. The output wattage of the Andrew Jones is 140 W.
Most bookshelf speakers tend to sacrifice the overall performance with a two-way design that demands that the base driver reproduce frequencies that are outside of what the speakers are truly capable of, but by contrast, the Andrew Jones has the capability to access the entire spectrum of different sound frequencies. These home theater speakers had been designed with a system comprised of four different Dolby-enabled models. Altogether, these different models offer a value-to-performance ratio for collectively building a high-performance 5.1 4-channel surround sound system. The cabinets of floorstanding, bookshelf and sensor-channel speakers are designed with sides that are gently curved in order to do away with the unwanted standing wave that are generally experienced with square design. The CST driver is mounted on its own individual enclosure, which allows it to be free from the pressure waves that are generated from the main enclosure. The finished cabinet can be integrated immaculately with both traditional and contemporary interiors, and a small footprint allows the speakers to be casually placed just about anywhere in the room without causing any spatial problems. One customer testified that these particular bookshelf speakers are slightly bigger than average, but they still found that the overall quality offered by the speakers was more than the hoped for. The customer reported that the Andrew Jones produced a sound with an impressive amount of bass for a 5.25-inch driver. The customer reported that they preferred to have a full and clear bass, not a very heavy bass, and the bass produced by the Andrew Jones was not overbearing. The customer reported that the bass was full and clear enough that they did not mind leaving their subwoofer turned off occasionally. The customer reported that the Atmos drivers were able to perform exactly as advertised. Though the drivers were initially just a bit finicky, they later discovered that the receivers are capable of enhancing the sound when the crossover is set to about 150 Hz. The dimensions of the Andrew Jones are 10 x 7 x 15 inches, and weighs 31.4 pounds. 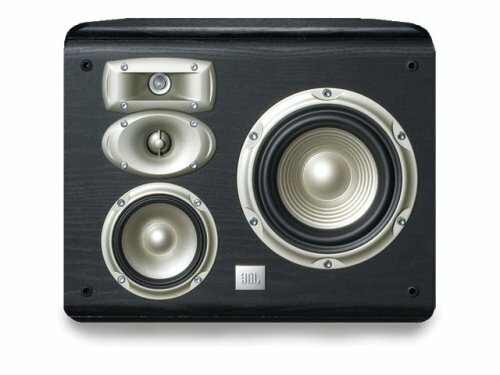 The speakers can be purchased for the price of $749.00. 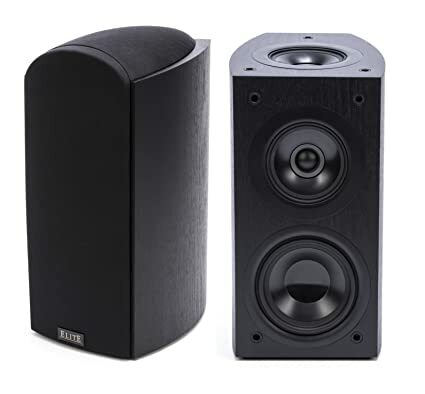 The JBL Studio 530 2-Way 5.25-Inch bookshelf speakers feature 5.25” low-frequency transducers with a PolyPlas cone. They also feature a 1” high-frequency compressor. There is a glass-filled ABS bi-radial high-frequency horn and a 19 mm ultra-ridged MDF enclosure. The Studio 530 system happens to be the most advanced JBL residential loudspeaker system to be released by the manufacturer today. These JBL loudspeakers share specific characteristics with the massive sound systems used in house theaters and concert venues. All of these high-quality speakers use constant-directivity compression drivers with a horn that can deliver the sound high-impact dynamism and realism. The dynamism and realism is what makes sound systems of a certain caliber capable of immersing very large audiences and particularly sound-sensitive listeners. The JBL Studio 530 bookshelf loudspeaker combines a symmetrical field geometry woofer with a host of other technologically sophisticated features in order to deliver a performance that many describe as extraordinarily lifelike. The unique integration of these features makes the Studio 530 system optimized for both the movie systems and music systems alike. The low-frequency transducer is made with a lightweight ribbed PolyPlas cone system. Each cone is surrounded by 1 to 1.5”-diameter woofer voice coils. The symmetrical field geometry technology, in tandem with heavy-duty magnificently, is what the system capable of creating a clean, all base response no matter what the sound frequency happens to be. All of the technologically sophisticated features of the speakers are stored in a rigid, non-resident cast aluminum frame, which ensures that the longevity of the speakers is just as powerful as the sound delivery that they are capable of the design of the drivers. Because of the compression driver, the Studio 530 speakers are able to produce sound that had a lower distortion and a greater dynamic range than what is commonly encountered in conventional midrange and HF drivers. Because of the implementation of the TMX compression driver, the clarity of the speakers is greatly enhanced, particularly on the lower levels. The glass-filled ABS bi-radial high-frequency horn has the power to minimize any occurrence of unwanted HF interaction with walls or furniture, creating a much smoother sound over a wider listening area. The MDF enclosure allows the Studio 530 system to deliver its sound without being interrupted by unwanted residence from its surroundings. Because of the no-loss, 2-way crossover network, the Studio 530 system can smoothly transition between woofers and the HF compression driver/horn. This crossover network system produces a sound that is completely free from coloration and distortion that would otherwise hamper the sonic clarity. One customer testified that they originally purchased the Studio 530 system from an online merchant before they had found out much about their specs. The customer already very positive past experiences with JBL speakers, and after reading two positive reviews, they decided to give the Studio 530 system a shot. The customer described the sound of the speakers as being highly articulate and much cleaner than other bookshelf speakers that they had owned in the past. The customer found that the Studio 530 was particularly optimized for playing rock, country, acoustic jazz, and the classical tracks. The dimensions of the speakers are 9 x 8.3 x 18.3”, and they weigh 37 pounds. The Studio 530 system can be purchased for the price of $1021.81. The JBL L820 4-Way High Performance Wall-Mountable Bookshelf Loudspeaker features a 1” pure titanium dome tweeter to create exceptional high-frequency sound performance. There is also a ¾” mylar-dome, cast-frame chassis mounted in a bi-radial horn which gives the speakers the ability to deliver a sound that has a particularly clean high-frequency response. With the use of aluminum waveguides, the JBL system can provide a much better quality of dispersion and possesses a larger sweet spot for listening. The 5-way bi-wirable binding post of the JBL is gold-plated. The sound frequency range of the JBL is between 55 Hz and 40,000 kHz. 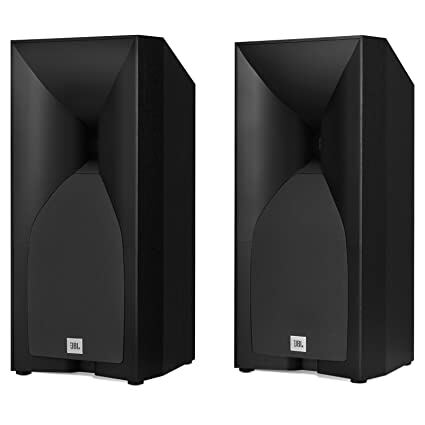 The JBL features a mid-range transducer and a low-frequency transducer that both feature a PolyPlas cone with a rubber surround and a HeatScape motor structure. Customers have testified that the sound performance is optimal for both music and movies. Customers are particularly pleased with the fact that the wall mounting capability spares them from having unsightly cables on the floor. One customer testified that they powered the speakers with a modest 50 W Harman Kardon receiver, and that if you wish to purchase the towers, you must be prepared to invest slightly more money into adequate receivers for powering them. The dimensions of the JBL are 5 x 15.5 x 12.7”, and the unit weighs 19 pounds. The JBL can be purchased for the price of $449.99. 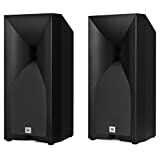 Many people would consider the design of the bookshelf speakers that they choose to be one of the most, if not the second most important qualification when choosing which model is the best for your purposes. It is important not to misinterpret the design of the speaker as the physical appearance that the bookshelf speaker has. Of course, the aesthetic appeal of the bookshelf speaker is most likely going to be of some importance to you, but the design to be concerned with here is of a slightly more technical nature. 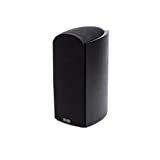 The design of the bookshelf speaker that you should be particularly concerned with has to do with both the abilities of the sound system with in the machine, and also the acoustics of wherever it is that you plan on putting the speakers once you’ve purchased and unboxed them. Typically, most bookshelf speakers that you consider will feature a compact design, though some of them actually happen to be larger than other speakers. If you happen to have a very large and spacious room, then fittingly, you’re going to want to avoid getting particularly diminutive speakers that can’t fully accommodate the large size of the room. In a similar fashion, you are going to want to ensure that you don’t buy speakers that are far too large to fit into a relatively small room. If you only plan on using a pair of bookshelf speakers with your desktop or your laptop, then you are going to want to ensure that design of the speakers isn’t so large that it takes away from the free space that you have on your desk. Before buying any type of speaker, one of your priorities should be to come to a complete understanding of just what it is that you intend to do with the speakers in the first place. Before getting swept up into all of the nice little features that the speakers have, you need to have a solid grasp on just how those features line up with your intentions. There are many different ways that a speaker can satisfy your desire for listening pleasure, but some speakers are so powerful that they are capable of satisfying the listening pleasure of both you and everyone else on the block; you may not necessarily need that degree of extreme power in a speaker. If you intend on only buying a bookshelf speaker because you’re going to listen to music, then naturally, you would most likely be pleased with a pair of speakers that offers you high-quality delivery in all different ranges of sound. 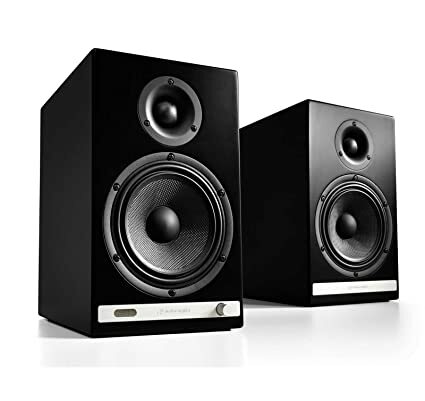 If you’re going to be using the bookshelf speakers for the purpose of watching movies or TV shows, on the other hand, then you may be more interested in a pair of speakers that has a good capacity for deep and booming base. If the speakers don’t inherently have the deepest capacity for base, then you might still be able to connect them to a subwoofer to achieve similar effects. If you are buying your speakers for the purpose of playing video games on your entertainment system, then you may find that you are best off with the same types of speakers that are generally used for enjoying movies or television shows. Bookshelf speakers used for playing video games would have to handle both low and high frequency sounds without any interruptions. A driver is the technological implementation that is responsible for the exact quality of output delivery that a speaker is capable of. Depending on the specific kind of drivers that a speaker has, the output delivery will be within a certain limited range. The different types of drivers that power speakers range from the following variations: mid-range drivers, squawkers, tweeters, woofers, and subwoofers. All of the different types of drivers have very unique sound frequency ranges that they are capable of, and the ones that are correct for you will depend on your specific needs. You should also be aware of full-range drivers that, under the right circumstances, are capable of single-handedly reproducing something an entire audio channel. Keep in mind that a full-range driver must be specifically designed for the purpose of covering the entire frequency range of sound. In addition to full-range drivers, another special kind the driver is a coaxial driver. Coaxial drivers basically combine two or more different types of drivers. Now, to go into greater detail about the different basic forms of drivers, consider the different ranges of frequency. The drivers that are responsible for middle frequencies, of about 300 to 500 Hz, are known as mid-range drivers. Mid-range drivers are sometimes referred to interchangeably with squawkers. Woofers are lower on the sound spectrum than mid-range drivers and squawkers. Typically, woofers are responsible for anything between the 40 to 1000 Hz range. The rock bottom of all sound frequency is covered by the subwoofer driver, which can handle a pitch that ranges from 20 to 200 Hz. The highest frequency of all drivers belongs to the jurisdiction of the tweeters. A tweeter is capable of handling anywhere from 2000 to 20,000 Hz. Understanding just what types of drivers it is that you need to produce the specific frequency of sounds that you are after will be one of the most important steps of making the best choice in speaker. When it comes to buying a speaker of any kind, there will be three different units of measurement that you should keep in mind at all times of the process. The three units of measurement that you should always be sure to keep in mind are as follows: Decibels (dB), Hertz (Hz), and Watts (W). Out of all three measurements that you should always keep in mind, decibels are those that refer to the loudness of the sound. The easiest way to remember how to consider decibels is this: the higher the dB, the louder the sound produced. Generally speaking, the dB rate will range from 0 dB to 194 dB. To put it in perspective, a normal conversation is typically anywhere from 60 to 65 dB. A loud musical concert, on the other hand, is capable of reaching dB ranges as high as 125 dB. The next unit of measurement to keep in mind is hertz. Hertz is the unit of measurement that we use to understand sound wave frequency. The easiest way to conceptualize this is to remember that the frequency of sound waves is generally referred to as pitch. An adult can generally perceive a pitch of anywhere between 20 Hz to 16,000 Hz, while a baby can perceive sound frequency from 20 Hz to 20,000 Hz. Depending on how technologically sophisticated the drivers of the speaker are, the hertz preciseness will either be sharp or dull. The final unit of measurement to consider is Watts. Watts, plainly put, is simply the unit of measurement that we use to interpret the electrical power output (or the energy conversion) used to power the machine. No matter what speaker that you buy, all three of the units of measurement will be important for giving you the greatest window of insight into exactly what kind of machine it is that you are buying. All bookshelf speaker shoppers should make a point to prioritize understanding the technical aspects behind the sound delivery of the speakers that they are considering. The different variations of sound delivery technology available to you when browsing different options for speakers can be quite overwhelming, which makes this one of the most imperative aspects to make sure that you conduct thorough research in. Being aware of every aspect of the speaker’s sound delivery will enable you to know exactly what the speakers offer you in terms of value. In the event that you’d like to get deeper insight into the sound delivery capabilities of any speaker, it may not be a bad idea to directly consult audio technicians who may be working in the physical store that contains the speaker that you are interested in. The relatively simple appearance of a bookshelf speaker greatly belies all of the fine, minor yet highly important details that contribute to be full potential of the sound quality that it can offer you. It can be very tempting to simply buy a speaker that appears to be the biggest and most powerful of them all from a glance, but you will be far more satisfied with your purchase if you take the time to consider just what the nature of your use of the speaker will entail. Make sure that you become at least marginally literate in the different ways that decibels, Hertz, and wattage collectively contribute to the tonality and frequency of your ideal listening experience.